This is a parody remix, in HTML5, of the classic games of Space Invaders and Asteroids, with an Amahi spin. 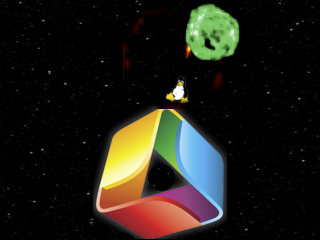 In this game you control the Amahi logo-shaped planet, outfitted with the Tux super blaster laser. Your mission, should you chose the accept it, is to destroy as many of the Amahi invaders rocketing towards you before they penetrate the hardened Open Source shield. These invaders will come from all angles and spare no expense in trying to bring Amahi down. Can you stop them?